We offer both white gold or yellow gold either in 4 prong or 6 prongs. by choosing your ring size. Your ring will be couriered to you. When you start shopping for diamond rings and engagement rings, there are many options, but you still may not find exactly what you want. The best solution is to design your own ring. Custom ring design can be done within your budget at Surat Diamond Jewellery. Our online store allows you to design your own solitaire ring online by selecting the diamond and setting using our online ring design tool. The first step is to choose your solitaire from our extensive selection of certified diamonds. while round is the most popular shape for solitaire rings, we have princess, heart, pear and other shapes as well, so you can create a ring with a style that is all your own. Read our education guide for information about diamond selection and diamond grading to help you design the perfect ring. The next step is to choose your setting. We offer a wide variety of white gold and yellow gold settings in four or six prongs. Choose from classic four and six prong engagement ring settings, unique two tone gold settings, and many other modern and traditional settings in white gold, yellow gold and two tones. 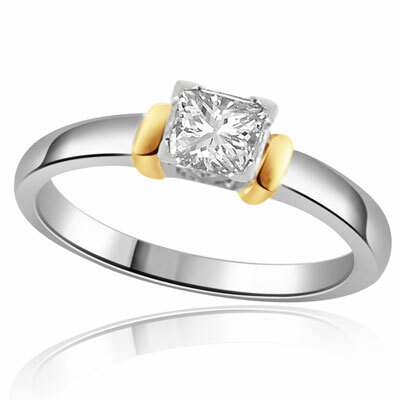 You can also choose solitaire diamond ring settings for men. Once you select the diamond and setting for your ring, you can buy it online through our store. We offer outstanding quality rings at prices that are 25 percent lower than retail price and global shipping is available for your order. For inspiration and to see the quality of our rings, view some of the rings designed and purchased by our customers. © Copyright 2010. Surat Diamond Jewelry. All Rights Reserved.